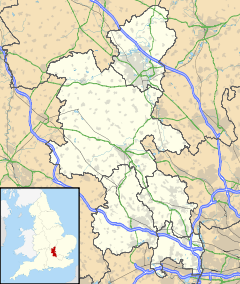 Fairford Leys is a development of 1,900 homes, on the western edge of Aylesbury, Buckinghamshire, England. It has its own centre hosting a number of traditionally fronted shops, award-winning hair salon, supermarket, three restaurants, a nursery, an ecumenical church and a community centre. It also has a private health club with swimming pool which opened in October 2003. The civil parish for Fairford Leys is Coldharbour which is an Aylesbury Vale district. It also forms part of the Aylesbury Urban Area. Fairford Leys has no social housing. Fairford Leys is often highlighted in urban planning publications as an exemplar sustainable development. There is much debate about whether it is an estate or a village. In town planning terms, it is an example of an urban village. In truth it is both, being linked to, and part of, Aylesbury. The intention in planning the development was to create an environment similar to that of a high end estate, with architecture inspired by traditional Aylesbury housing styles and pastiche Victorian lamp posts and railings. The centre of the estate is surrounded by the "city wall", a concept originating from the masterplanner John Simpson and inspired by mediaeval city walls, such as York. This consists of three- and four-storey townhouses and the main entrance to the centre is marked by two towers, loosely modelled on mediaeval gate towers. The centre contains a higher density of housing, with larger detached properties at the edge of the estate. The design includes play areas, open spaces, playing fields and a golf course. The development is planned around a masterplan and design code which were drawn up by John Simpson & Partners Architects, to maintain the general appearance of the development. The design codes are enforced by the landowner through private covenants with individual householders, and contain restrictions on alterations to properties. Although these are time limited in part. Fairford Leys is one of the first two developments in the UK to be planned around a design code, the other being Poundbury in Dorchester. The development is built on land previously owned by the Ernest Cook Trust—a nationally operated, charitable foundation with interests in land ownership, conservation, architecture, design and community development. To ensure that these concerns are reflected in the achievement of Fairford Leys, the Trust has worked with Aylesbury Vale District Council for over 14 years — largely through its masterplanner, the well-known architect John Simpson — and with the builders Taylor Woodrow, Bellway and George Wimpey Homes. Although Aylesbury Vale District Council ultimately granted planning permission for the development, they took a "back seat" role in the design and planning of the village; the driving force behind which was the Ernest Cook Trust. Fairford Leys contains housing up to five-bedroom detached properties, which has ensured its population is representative of multiple life stages, from young singles, through young and growing families, to the retired. The hope is that people want to stay in Fairford Leys, moving house within the village as needs change, this is already being realised in many cases. Some residents work locally, while many others commute to London, and some of those that are around during the day have found time to develop such initiatives as the Mother and Toddler Group and the Friendship Club, which may play a significant role in helping to build a sense of community. Fairford Leys has its own parish council (Coldharbour Parish), primary school, GPs' practice and neighbouring pharmacy, veterinary practice, Women's Institute, ecumenical church, and a community centre (known as the Fairford Leys Centre), which hosts a wide variety of events and activities, including dance classes, badminton, karate, children's parties, wedding receptions, corporate functions and council meetings. The village centre was officially opened in November 2004. St Mary's Church of England School is a mixed, voluntary controlled, primary school, which has about 320 pupils from the ages of four to 11. It was purpose built for the Fairford Leys village but the education authority (Bucks County Council) underestimated the number of children that would live within the village. Consequently, a number of children living within Fairford Leys cannot get a place. In 2009, Buckinghamshire County Council estimate that up to 44 children will not be able to take up a place. Fairford Leys is served by a popular and frequent bus service, the Silver Rider. It commenced in 2004 and runs directly to Aylesbury town centre in around 15 minutes, designed to run at times to suit commuter travel from Aylesbury Station to London. Wikimedia Commons has media related to Fairford Leys. BBC: Can a village really make you healthy? This page was last edited on 31 March 2019, at 11:19 (UTC).